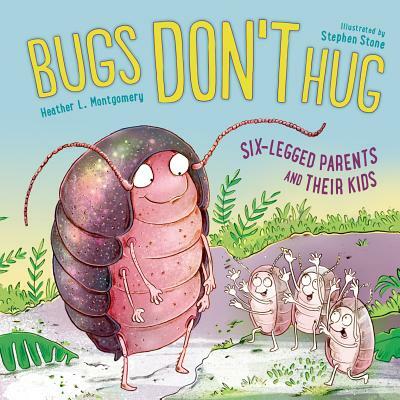 Meet the mamas and papas of the insect world in this fresh and funny nonfiction look at how bugs are like us from popular science author and teacher Heather Montgomery. Most insects don't take care of their young, but some do--in surprising ways. Some bugs clean up after their messy little ones, cater to their picky eaters, and yes--hug their baby bugs. A fun and clever look at parenting in the insect world, perfect for backyard scientists and their own moms and dads. Back matter includes further information about the insects and a list of resources for young readers. Heather L. Montgomery is passionate about bugs, discovery, and the scientific process. An author and master teacher, she uses curiosity and yuck-appeal to engage young minds. Her most recent books are Unsolved Mysteries of Nature and How Rude! Real Bugs Who Won't Mind Their Manners. Heather has a BS in biology and an MS in environmental education. When she's not writing, she can be found climbing a tree, knee-deep in a creek, or catching bugs with kids in beautiful Alabama. Are bugs good parents? Are they loving and affectionate? Do they feed their offspring? Playful contrasts between human and insect behavior will captivate young readers as they listen to the read-aloud-friendly text and view the alternating cartoonlike spoofs on human living and detailed bug environments. In one picture, a bug hides its eyes and exclaims, "Where's Baby?" to two excited baby bugs. The text reads: "Bugs don't play peekaboo." After the page turn, the text reads: "But tortoise beetle babies do get to hide." The illustration displays an un-anthropomorphized tortoise beetle mother realistically sheltering "her young under her speckled shell." The book uses this format throughout to show true insect behavior in a way that young children can absorb easily. On another page, the text reads: "For dinner bugs don't make soup." Some adults may not be charmed by the burying beetles that use their saliva to create a "soupy meal" in craters of mouse meat for their little ones, but kids will thoroughly enjoy these weird facts. The last spread shows an interracial family (white dad and black mom with a biracial child), lots of bug toys, and the message learned through this journey: "Bugs ARE like us" ("aren't" is crossed out). Further information about the insects is presented in the informative backmatter along with an exhortation to get outside and explore nature. A thoroughly amusing way to introduce kids to bug behavior. Through cartoonlike drawings, this book assures young audiences that bugs don't engage in everyday human activities, like making scrambled eggs for breakfast or getting tucked into bed at night—at least not until a page turn offers up comparatively realistic drawings of insects engaging in parallel behaviors. For example, mama bugs may not play peek-a-boo. But, on the next page, a tortoise beetle mother tucks her young under her shell to hide them from predators. Mama bugs don't bake birthday cakes, but dung beetle mamas do tuck their eggs inside pig poop cakes so that their babies can eat their way out. And so it goes, through spit soup and snuggly nests, sending the message that bugs do demonstrate some recognizable qualities, and so are worthy of curiosity and further exploration. Concluding activities include brief profiles of the featured bugs, additional reading selections, and a note to parents, promoting shared wonder and respect for all creatures.